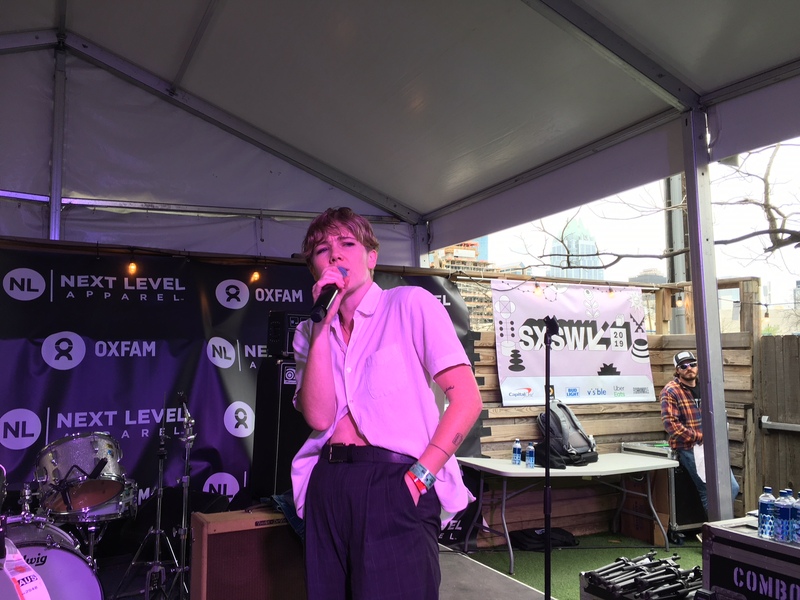 As usual, South by Southwest was exhausting, hard on the feet and easy on the ears. 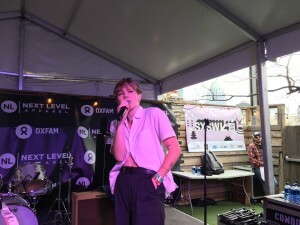 This year — once again roughing it on the free, unofficial showcases — I saw a slew of talented performers for the first time. In recapping SX this year, I’ll focus on my favorite of those first shows. Granted, some people I’ve seen before and written about here before (Erika Wennerstrom, Bleached Roses) were their typical excellent selves as well. But the most fun part of SXSW is often the new. Here, in no particular order, were my favorite performances from artists I saw for the first time at this year’s festival (well, the top one was my favorite. Other than that, no particular order). Included for each is a sample of their sound courtesy of the YouTubes. Tomar and the FCs at South by San Jose. 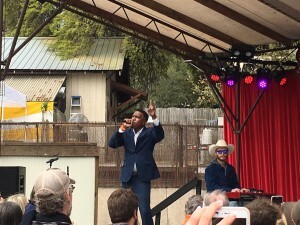 There’s just no denying the package of power and danceable fun that have made Tomar and the FCs an Austin must-see after only four years of performing and three years of recording. A soul man of incredible vocal ability and boundless onstage energy, Tomar Murphy basically splits the difference between James Brown and Sam Cooke, belting out ballads like “Day by Day” and growling rock ‘n’ soul numbers like “Heart Attack” with equal dexterity, and making sure every inch of the stage that isn’t covered by an FC is covered with his footprints. 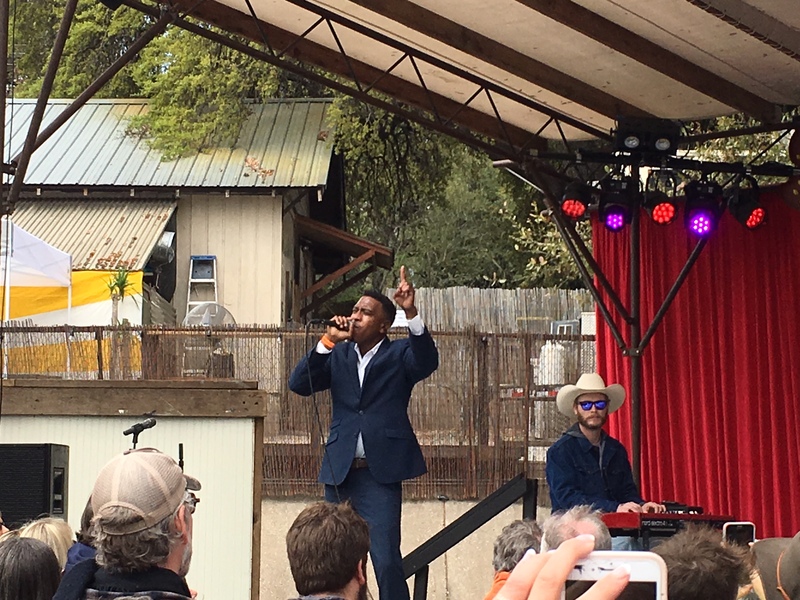 Here’s perhaps the best exemplifier of how Tomar and the FCs’ performance Saturday to open the final day of SX San Jose played out: Murphy started the show wearing sunglasses, a white dress shirt and a blazer. 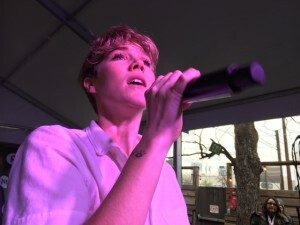 By the time the band stormed through its 40-minute set — which started at 1 p.m. with the temperature in the upper 50s — all three were gone, leaving an overheated Murphy with just a green T-shirt on top. Hey, soul music is about stripping down to reveal what’s underneath it all, yes? Murphy is both a student and a natural. And can the FCs ever back him up. 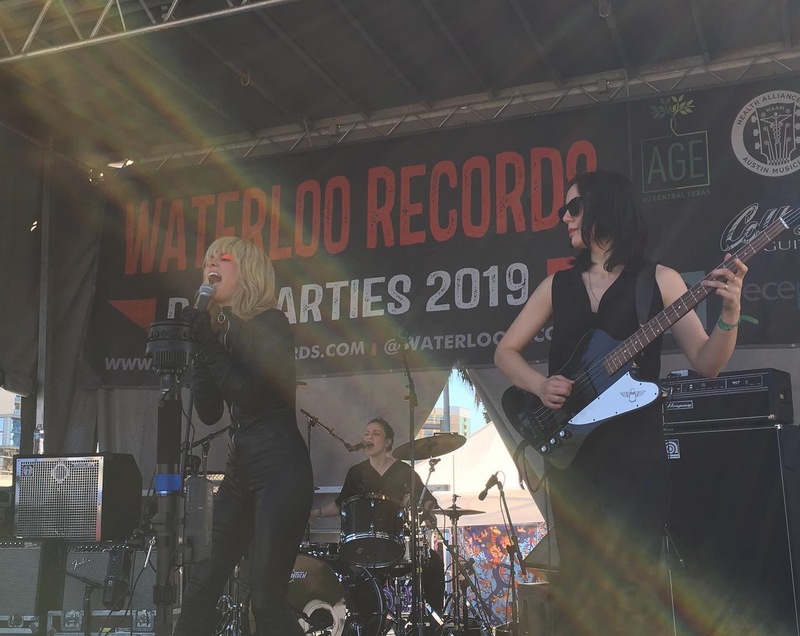 There’s an enticing trace of Sleater-Kinney in the raw but refined-enough postpunk of Washington, D.C.’s Priests, mostly owing to their darkly primitive, minimalist sound and the wailing power of singer Katie Alice Greer. But unlike S-K’s usually guitar-driven sound, Priests’ performance on Thursday at Waterloo largely rode the rumble of bassist Taylor Mulitz, who kept heads bopping while Greer — looking appropriately rock-star in a black catsuit and orange eye makeup — held the eyeballs of what should’ve been a much bigger crowd. Drummer Daniele Daniele sang lead on a couple of songs, showcasing Priests’ versatility. After Priests’ 2017 album Nothing Feels Natural became one of the indie rock favorites of that year, the April 5 release of The Seduction of Kansas should be one of the most anticipated independent albums of 2019. In this age of groupthink cynicism and increasing dismissiveness of old ways, it’s easy to be cynical and dismissive of a band whose onstage persona adopts so much of the quintessential “rock ‘n’ roll!!!! !” showmanship as does Norway’s Death by Unga Bunga. DBUB are rowdy garage rock for true believers, fond of a good car-radio melody but primarily always in search of a gnarly, driving riff, flaunting as many as three guitars at a time during their Waterloo performance Thursday. If the psyched-up punk-rock madman act isn’t something you think has been done too many times, then either it is or it isn’t time to introduce yourself to DBUB lead singer and scenery-chewer Sebastian Ulstad Olsen (top photo). When he wasn’t joining two other guitarists, Olsen stalked the stage as if he was in the midst of either coke rage or ‘roid rage, seemingly cussing himself out, jumping into the Waterloo parking lot and flipping off onlookers, and at least once spitting in the crowd’s direction from the stage. Although vintage garage and punk are their primary reference point, DBUB also incorporate the crisper power chords, guitar-god solos and general flash of ’70s classic rock. That was best exemplified by an extended jam in which all three guitarists and bassist Ole S. Nesset copped the riff from “The Boys Are Back in Town,” playing it with their guitars tucked behind their heads. Whether Olsen and Co.’s level of showing off is awesome or nauseatingly overdone is a matter of taste. But Death by Unga Bunga showed they can play them some rock, and their confidence in doing so was enough to overwhelm any uncertainty about whether they were trying too hard. Had seen the name a lot, had never gotten to experience him. Tessmer is a pure blues-rock guitarist in the Gary Clark mold, and a stellar one to experience in person, with a rugged vocal approach and snarling tones and lead lines. He’d be exhilarating to watch over the course of an hour set or more. Unfortunately, at Yeti he played for a tick under half an hour, and given that time constraint, I could’ve used a little less of the extended jamming he engaged in. Sure, it displayed his skills, but I would’ve liked to see him fit an extra song or two into the set instead. Still, he’s a rising local talent for very good reason. There’s a good chance most of the Clive Bar crowd that came out to see one-woman band Your Smith (Caroline Smith, for real) had never heard her beyond last year’s smoothly beaty debut single, “The Spot.” So it was more than a little surprising to see Smith — playing her first SXSW festival — open with “The Spot” and risk an exodus from Clive Bar. Fortunately, that didn’t happen, and Smith’s cheerful, infectious stage presence gave plenty of people good reason to stick around. She swayed and half-moonwalked to her self-programmed beats and appeared to be having all kinds of fun while displaying a repertoire of other engaging pop songs like “Debbie” and “Bad Habit.” Those who might know Smith as the folk-rock leader of Caroline Smith & the Good Night Sleeps may not be a huge target audience for her new, poppier venture. Her charming suggested she’ll be able to carve out this new niche with or without them. Your Smith at Clive Bar.